What happens when you mix a bookshelf and playground? You get a playful mix of smart storage, inspiration for reading and active play value. Case in point: Casaurus, the senior thesis project of student designer Koichiro Hoshino from Tokyo University of the Arts. The designer’s dinosaur-shaped bookshelf includes plenty of space for a bookworm’s library, a tail-like slide for kids to whiz down, shelves made for climbing and small boxes that add length to the dino’s tail. Kids can also find a reading nook underneath the dino’s belly. The awesome indoor playground is destined to keep kids busy. For parents, the Casaurus’ big plus is that you’ll have no trouble finding a spot to organize every last book and toy your kids own, and they might even think it’s fun to put stuff away in such a cool dino structure. Even though you need a whole playroom to house this giant-sized bookshelf, we think it’s a pretty cool way to put reading into motion, especially for those dino loving tots! Now if only Hoshino’s design was for sale. 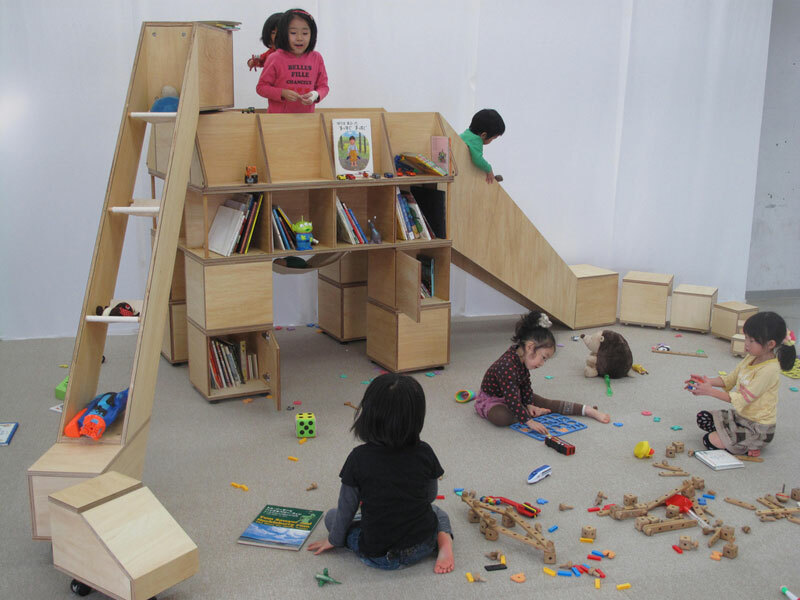 What happens when you mix a bookshelf and playground? You get a playful mix of smart storage, inspiration for reading and active play value. Case in point: Casaurus, the senior thesis project of student designer Koichiro Hoshino from Tokyo University of the Arts. The designer's dinosaur-shaped bookshelf includes plenty of space for a bookworm's library, a tail-like slide for kids to whiz down, shelves made for climbing and small boxes that add length to the dino's tail. Kids can also find a reading nook underneath the dino's belly.